They made a fake nose for him to wear but it changed his appearance so he never wore it. no, but you're still not right. keep guessing. both of you . . . and anyone else. I think I remember him saying that he wouldn't want to imitate Andy. He said something like "I looked like Andy when I felt like Andy" or something like that. true. . . but that's not the answer to the question. lol. you gotta answer the one I asked and get it right before you ask a question. sorry. . .
compare the differences, that would make it a little easier. nope, it's not his nose, hair, and there's no wig. lol. ok. here's a picture of Andy Kaufman. I meant to make it really hard. I think this "game" is useless without all of you getting so stumped. this is fun seeing you all get so stumped. but if you insist, here ya go. 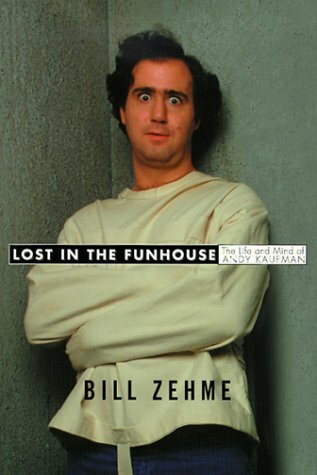 http://sj.blacksteel.com/media/images/Andy_Kaufman.jpg . . . don't know if you'll be able to see it in this photo but I saw the book cover in the bookstore, and I saw the answer right away. if you have a good color printer, print it out to help you see what Jim didn't do that he could have done to make himself look like Andy. good luck! Maybe the eyes. Could he have worn contacts to give him the same color as Andy's eyes?